I've been in telephony and networking for nearly 30 years. Started in R&D at a PBX manufacturer in 1979, then did a stretch with the, at that time, worlds largest Ethernet company. Then I worked on a Fiber Optic Voice and Data MAN (IEEE 802.6) and have been manufacturing telecom products for the past 14 years. I think that gives me the qualifications to critique this book even without having to mention the Ethernet board I designed for IBM was featured on the cover of PC Week Magazine in 1987. This is a very good book. If you are a VoIP systems integrator or do anything with Asterisk, this book is a must have. There are major problems with the current state of the VoIP industry. The two biggest problems are security and the unavailability of a decent broadband connection with QoS and an SLA below $400 per MegaBit. Yes $400, but we're talking guaranteed availability and less than 0.5% packet loss,and 50mS or less latency with real penalties for not meeting the SLA. Before reading this book I would not have considered putting an IP-PBX on an ADSL link. The author's idea of putting a Sangoma ADLS modem in the Linux box with PPPoE client software and controlling the modem queue is nothing short of genius. Then to top it off with the AstShape QoS scripts and the QoS monitoring tools, this book is an absolute bargain. With these tools I'll not only know if the ADSL connection is capable of supporting VoIP service, but I'll know exactly why. Much better than cutting over to the VoIP system and later discovering the problems. The whole book is just full of great ideas. There is something in this book for everybody from the Skype user to a single VoIP phone owner, Asterisk, or enterprise PBX administrators. Just check out the Table of Contents. Amazon does not have the Table of Contents available but it is on the O'Reilly website oreilly D0T C0M. While the book is an asset for seasoned VoIP integrators, it is also a very good resource for someone completely unfamiliar with VoIP with a desire to learn. You can start out with free software for a Windows PC, progress to purchasing a single VoIP phone, then to a Linux PC. If you are leary of Linux, either get over it or you should probably stay out of VoIP altogether. Voice over IP, as with most emerging technologies, in the process of shaking up the world, in this case Public Switched Telephone Network and Plain Old Telephony Service. The author starts of the book off at the most basic entry point for most consumers into the world of VoIP, which is background about the main commerical carriers such as Vonage. The introductary chapters continue to build on the most elementary approach, giving the reader advice on modifying the soft phone[s] that the respective carriers will allow or provide to the consumers, such as alternating ring tones. It isn't long before Ted is explaining how to compeletly re-wire the house over to a pure VoIP infastructure using the existing wiring in your home as well as an, or the ATA provided by the carrier. While this is undoubtly over the casual readers head and possibly comfort level it is good see that this option is explored and explained for those that might not be aware of this solution. Of course, other VoIP solutions are explored. Skype, is mentioned and basic features are explored, although the detail provided on Skype is not as detailed as those of other solutions, which maybe due to the coverage for Skype under the Skype Hacks book. However, the coverage for building your own VoIP via Asterisk is quite detailed and in-depth. Options that explored for this approach, are call forwarding, hold music, voice mail applications and distinctive ring as well as basic advice on setting up and compiling the application. The process appears to be able to easy to implement, but alas was not tried due to this reviewers use of Skype for his VoIP needs. Also in the closing chapters of the book, issues of improving QoS are addressed as is the legacy signalling protocol that H.323 is since the adoption of SIP. Since QoS is vital to ensuring that VoIP traffic receives the bandwidth that it needs Ted gives us some basic commands to find out if there is jitter [dropped datagrams] and some ways to fix this issue. However, it should be noted that this chapter, as with most of the later half of the book is more in line for larger scale operations that use Linux/Unix and building their own office VoIP solutions. To summarize, VoIP hacks does offer something for everyone, although the hacks provided in the latter chapters are geared to the enterprise level deployment of VoIP. That's not to say that the information is not relevant or even eye opening, just the average home user will find little to apply this to. Emphasizing the conceptual development of statistical ideas, MIND ON STATISTICS actively engages students and explains topics in the context of excellent examples and case studies. This text balances the spirit of statistical literacy with statistical methodology taught in the introductory statistics course. Jessica Utts and Robert Heckard built the book on two learning premises: (1) New material is much easier to learn and remember if it is related to something interesting or previously known; (2) New material is easier to learn if you actively ask questions and answer them for yourself. 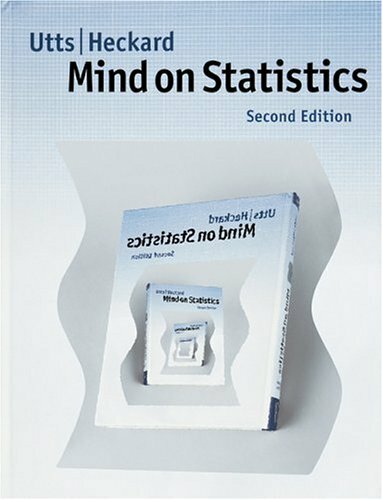 More than any other text available, MIND ON STATISTICS motivates students to develop their statistical intuition by focusing on analyzing data and interpreting results as opposed to focusing on mathematical formulation. The new edition of this exciting text, enhanced with new material and features, appeals to a wide array of students and instructors alike. So many words for so little content. Our students hate it and it's a nuisance to teach from. the best thing abt this book is that it teaches basics with simple examples,then takes to next level,so from beginners to expert point of view concepts are clear. The world's most business-critical transactions run on Unix machines, which means the machines running those transactions attract evildoers. Furthermore, a lot of those machines have Internet connections, which means it's always possible that some nefarious remote user will find a way in. 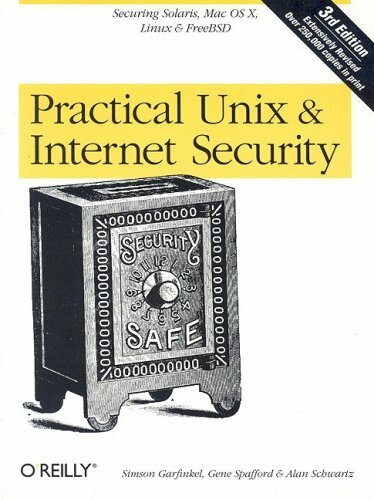 The third edition of Practical Unix & Internet Security contains--to an even greater extent than its favorably reputed ancestors--an enormous amount of accumulated wisdom about how to protect Internet-connected Unix machines from intrusion and other forms of attack. This book is fat with practical advice on specific defensive measures (to defeat known attacks) and generally wise policies (to head off as-yet-undiscovered ones). Topics covered: Security risks (and ways to limit them) under Linux, Solaris, Mac OS X, and FreeBSD. Coverage ranges from responsible system administration (including selection of usernames and logins) to intrusion detection, break-in forensics, and log analysis. This book is just what I was looking for. Excellent Security Guide to day to day security issues at my workplace. Information about TPC and UDP ports and their security risks have been very useful. This book must be part of every UNIX System Security Profesional. I saw that there is a bargain of another paperback edition on the page of 3rd edition, so I didn't recheck whether it is 3rd edition. So I end up in buying 2 books, 2nd and 3rd editions, because I need the 3rd edition for my class. It would be better to put edition number up in the page, not only paperback or library binding! 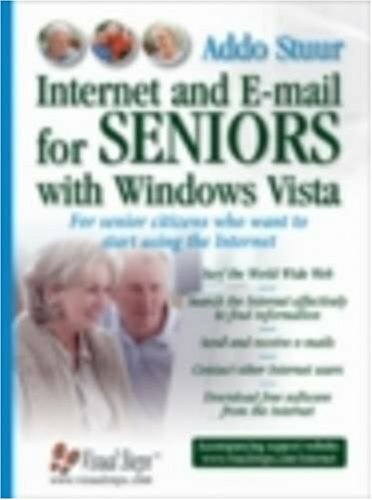 Written for the beginning or intermediate computer user over the age of 50, this large-print guide introduces seniors to the Web, leads users through the basics of searching and finding information on the Internet, and describes the fundamentals of e-mail management. Electronic communication and connecting with other Internet users is described, including details on customizing a Web browser, downloading free software suitable for use with Windows XP and Vista, and protecting against viruses. I don't think athe author of ny "beginner's" book realizes the state of mind of a "true" beginner, with only the book for help. How do I turn it on? How do I turn it off when I am finished? What do I do with initial pop ups from security, the computer store? An uunknown source and purpose? How do I get to e-mail? If a knowledgeable helper gets the beginner past these blocks, the book is very good as a "look it up" book. This series is very popular with seniors at my public library. The writers clearly understand the needs of their target audience. This book in particular is exceptionally well-written. The information is organized into meaningful sections and the book does not drown the reader in technical details that the readers do not need to know in order to accomplish their goals (i.e. surf the web and send & receive email messages). 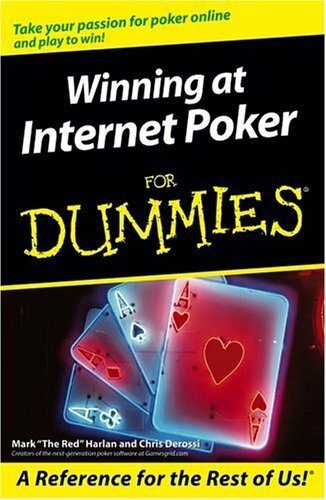 Good for people that know little about playing online. Not much info on playing the game itself. 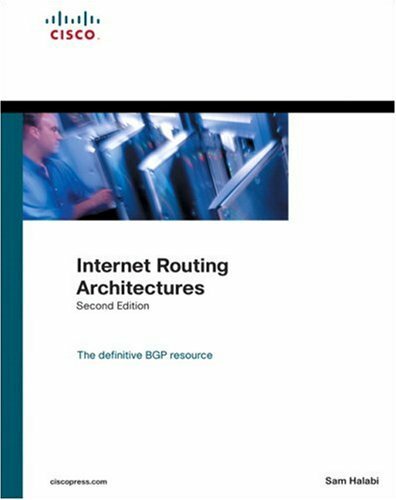 This is a really great book on BGP and Internet Architecture. The explanation of BGP at the protocol level is great. More importantly though is its explanation and examples of using eBGP / iBGP with an IGP. I've heard it criticized as being dated and too Cisco specific. Though it is Cisco specific, it's still very relevant. I would start with this book and read past NANOG presentations on introductory BGP if I wanted to learn how the Internet works. I have always felt that I am part of the small minority that just does not see the beauty of this book if studying for the CCIE. I have, for years, read other's comments on the how Halabi's "Internet Routing Arch" is a `must have', yet I still have not found a similar reason why. While I do feel that the book does (probably) the best job at explaining BGP and how to implement BGP in a Cisco-centric world, I have not discovered the value for the CCIE. I would much rather spend my time with CiscoPress's "Routing TCP/IP" Volume 2, by Jeff Doyle and Jennifer DeHaven Carroll than this book. Page 106 - "...any traffic that has an origin OR destination that does not belong to the local AS." This clearly should be an AND, not OR. Page 315 - "You can also specify a PREFIX list..." - I believe this should be a filter list, not a prefix list. And then there are places where the book is too opinionated - for example - page 206 "Many operators choose to filter dynamically learned defaults to avoid situations in which traffic ends up where it is not supposed to be." I do not feel this is true, and can think of multiple times when not filtering the advertised default route may just end up being the worst option. In fact, I do not feel either configuration is the right configuration to admit or condone, as the wrong configuration can have disastrous effects. I still have to give this book 4 stars - simply because of it's utilitarian value and overwhelming sense of loyalty given to this book by others. But I don't reach for this book too often. This encyclopaedia traces the extraordinary history of the Ancient World, from the first farmers, and the early civilizations of Mesopotamia, Egypt, Greece and Rome to the eventual decline and fall of the Roman Empire. It covers all aspects of life in the Ancient World - from building the pyramids to a day at the Roman Games. There are photographs of glowing treasures in gold, silver and precious stones, 3000-year-old wall paintings with vivid colours, and blackened, shrivelled mummies, combined with reconstructions and cutaways of architecture, to recreate the atmosphere of the time. Internet links are given to a selection of recommended Web sites, containing additional information for school projects and homework. Many of the Web sites include sound, animation or video clips, which bring the subject to life. Customer Review: A Must Have for any Home Library! This book is a GREAT resource for your family. Your kids will love the pictures and facts scattered throughout the pages. It is well organized, colorful, and full of information. My kids are 9, 8, and 6 and have all benefitted from having this book at home. This book makes reading assignments fun! Great for homsechoolers, and the internet links are terrific. Even as an adult, I have enjoyed reviewing the stuff I learned when I was in school as a child. The only downside to this book is that some of the pictures cover the page numbers. This makes it a little hard to find a certain page because this sometimes occurs for several pages in a row. Customer Review: Exactly what I needed. I am teaching my children ancient history and needed something to give my curriculum some meat. This book does it! Very thorough (100 pages on Egypt), colorful, covers concepts such as government, religion, architecture, and daily life for each civilization. Even mentions a few empires other books don't bother to bring up.